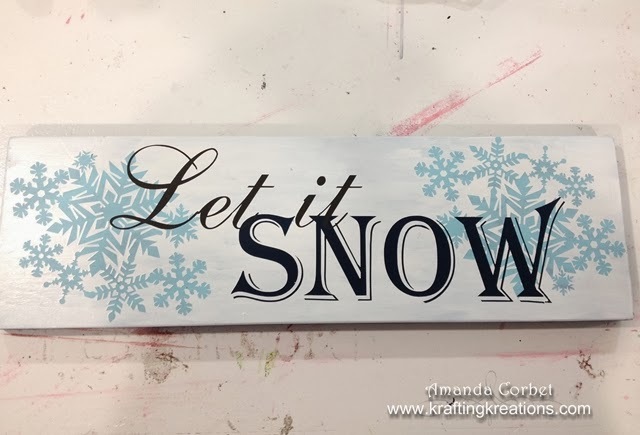 Dress up your home for winter with this adorable snow inspired sign! Don't be afraid to try this project. It is so easy! Since we're going for a vintage distressed look you don't have to worry about each step being perfect. 1. Start off by sanding your 1 x 4 with the 80 grit sand paper just to smooth out the top, corners, and sides. Then paint a coat of Charcoal Gray on the top. It is actually a very nice dark brown. Allow that to dry for about 15 minutes or so. 2. Layout the following on your Silhouette software and cut some vinyl. It doesn't matter what color you use because we are just using it as a template. 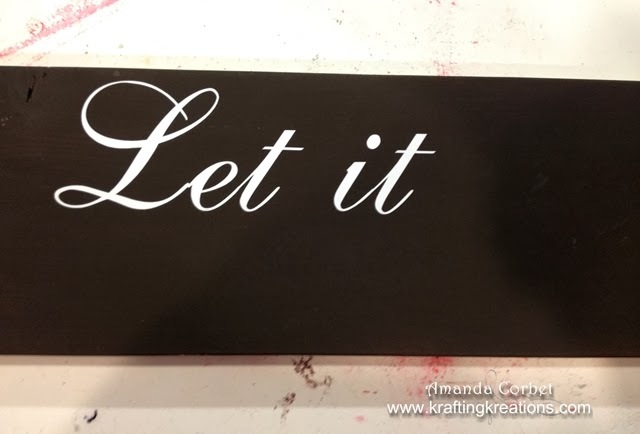 For the "Let it" I used the font ALS Script and made it 2-1/2" tall x 7" wide. 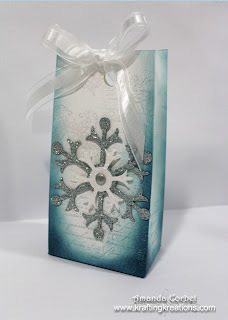 For the "SNOW" I used the font Algerian and made it 2-1/2" tall x 9-3/4" wide. Weed out the bits of vinyl you don't want and use transfer paper to pick up your vinyl. Once it's on the transfer paper I cut my words and snowflake clusters apart so I could add each one separately. 3. Now that your Charcoal Gray layer is dry add the "Let it" closer to the top left of the board. Coat the top with a layer of Decou-Page. This will prevent any seepage of color from the next layer of paint. 4. 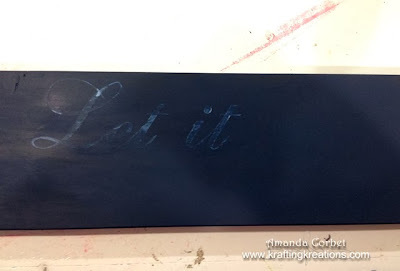 After the Decou-Page is dry add a layer of Deep Midnight Blue paint over the top and all four sides. 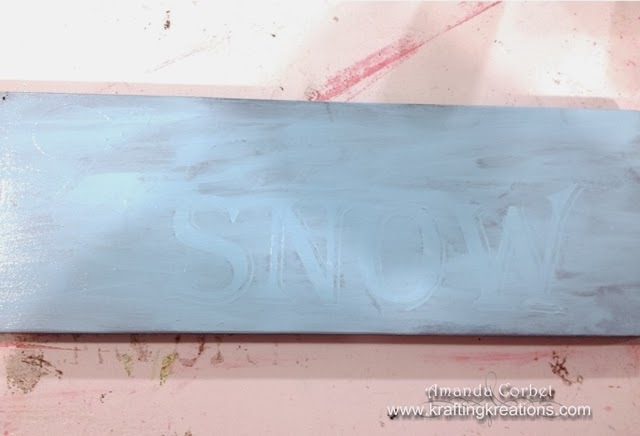 Allow this layer to dry. 5. Apply the "SNOW" vinyl closer to the bottom right of the board. Paint on another layer of Decou-Page on the top. 6. 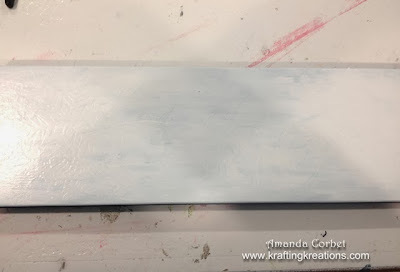 Once the Decou-Page is dry paint on a layer of Whispering Turquoise just on the top. Allow to dry. 7. Apply the snowflake clusters in both corners and coat the top with a layer of Decou-Page Now apply two coats of Cool White allowing the paint to dry between coats. 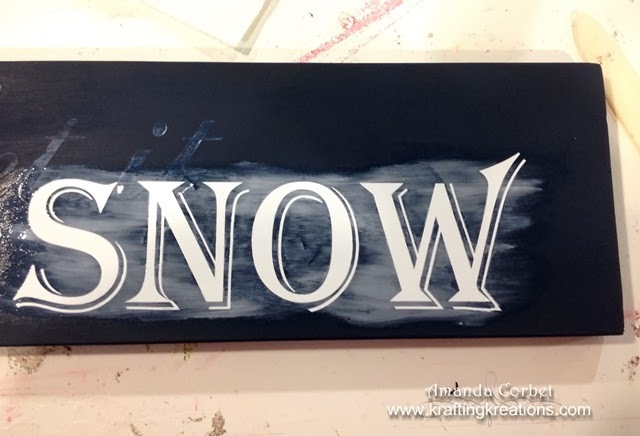 The thing I love about acrylic paint is that it only takes about 15-20 minutes for the paint to dry so you don't have to wait very long between coats. 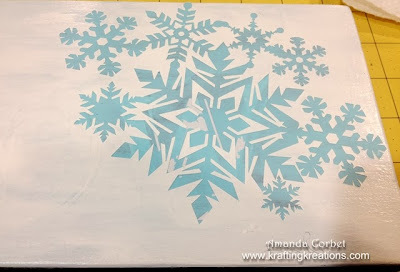 When your waiting for a layer to dry is a great time to straighten up or organize a little bit of your craft room while your waiting for it to dry. Or to work on another project between coats. 9. 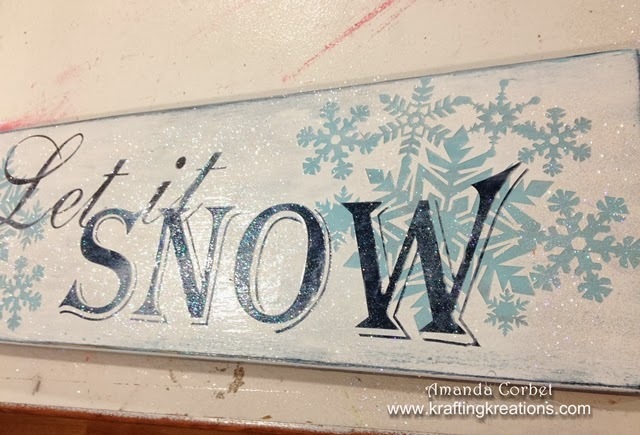 Now take your sand paper and sand the edges until you like how it looks. On mine you can see some of each layer of paint and even some of the pine below. I love it! Then coat with one final layer of Decou-Page on the top and sides just to seal everything in. Right after you finish applying the Decou-Page sprinkle on some ultra fine glitter just lightly over the whole thing. Allow to dry completely. 10. Take a paper towel or Swiffer sweeper wipe to brush off the excess glitter. Crafting Tip: Keep a box of the Swiffer sweeper refills next to your craft area. They are great for cleaning up glitter! 11. Screw two eye hooks in the top of the board. You can just screw these in by hand or use some pliers to get it screwed in all the way. If you're having a little bit of trouble getting the eye screws started just take a hammer and tap it a couple times to get the threads to grip the wood. 12. Cut a piece of 20 gauge craft wire 32" long. Bend up one end about 2 inches from the end of the wire. 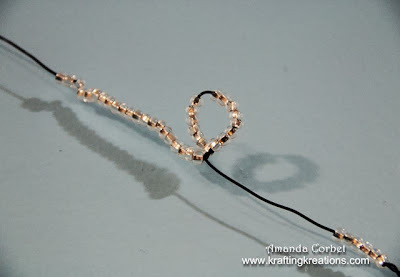 Add a small handful of clear beads onto the wire then bend up the other end about 2 inches from the end of the wire. Now take the wire and twist it around your finger to create a few decorative loops in the wire. 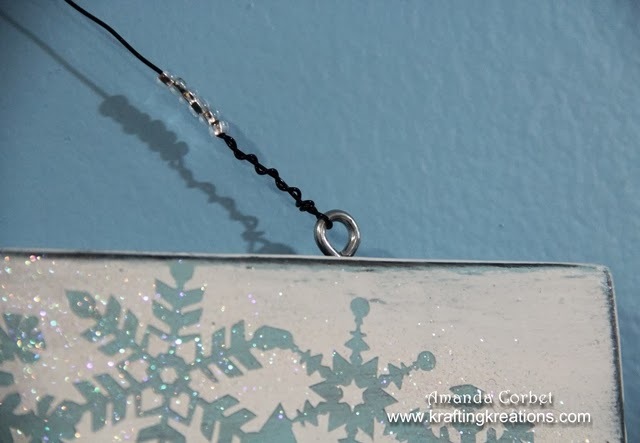 Make sure to let a few beads slide into the loop. Add a loop in the center of the wire to hang your sign from. 13. Insert the wire ends into the eye hook, then twist the short end of the wire around the wire. Use pliers to pinch the end of the wire close to the wire so you don't get scratched by it. 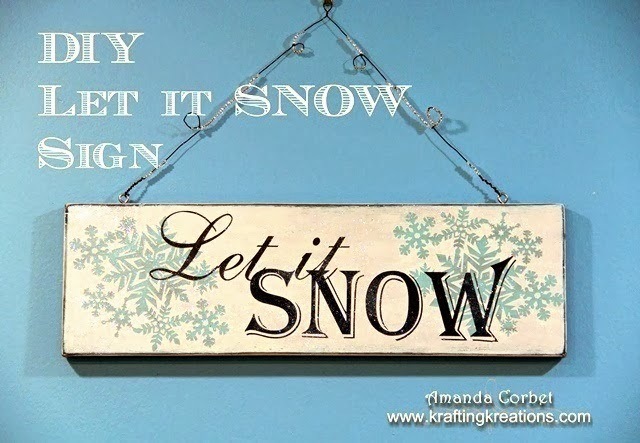 Now simply hang up your lovely sign and enjoy! This sign was really easy to make even though it requires a few steps. I worked on it across a few evenings and I am so happy with how it came out! Don't you just love it when a project turns out almost exactly how you saw it in your head? 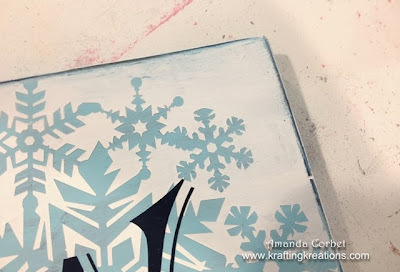 I hope you've enjoyed this fun tutorial and get a chance to make one of these for yourself! 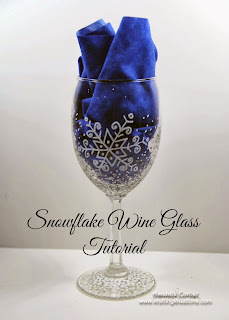 If you would like to check out some other snowflake inspired projects like my Snowflake Gift Box and Snowflake Wine Glass Tutorial just click on the pictures and it will take you to the post!